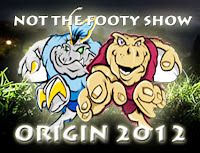 NOT The Footy Show's NSW and QLD Game 2 Review will be released on Thursday June 14 via an iTunes Podcast. Subscribe to the Podcast here. Mind you we all thought this 12 months ago when NSW comprehensively won Game 2 in 2011, but let's not dwell on Game 3 last year and instead talk about the big moments in Game 2 THIS YEAR. New South Wales won - stick that up ya Cane Toad Queensland! As much as you'd like to end the recap in that fashion it's not fair to how well Queensland hung in and then almost won the game, and conversely how much NSW improved from an already impressive Game 1 performance. NSW didn't deserve to win Game 1 - anyone who tells you that was the case is kidding themselves - but NSW were denied a chance to win that game, this time however it was Queensland who were denied their chance to win the game by failing to crack the NSW defensive line for the final 18 minutes of the game with the Blues up by just 4 points. That is your Stat that mattered. The Queenslanders - even with a hampered Billy Slater - still had ample opportunity to win the game when it was there to be won, but like the Maroons did to the Blues in Game 1 - the home team held out and Michael Jennings produced a superb play to knock the ball out of Brent Tate's hands when the lead was about to change. The game was superb - Origin at it's best and not spoilt by the referees who got their only big call 100% right by not awarding a penalty try just after halftime to Todd Carney when Cooper Cronk pulled him back. NSW got the penalty - took the two points to level the score at 6-all and Cronk rightly sat for 10 minutes. A stretch of time, that like Game 1's Michael Jennings sin bin - shaped the contest. NSW struck with two tries - a second for Brett Stewart after Carney took the line on and a fortunate one when Jarryd Hayne ran over Johnathan Thurston only to have the ball raked out, hit Hayne's foot and Josh Morris swooped on it and outran Greg Inglis to give NSW a 16-6 lead in the blink of an eye. Then Queensland came... and kept coming. Inglis jumped all over another appalling Akuila Uate kick read (there were many) to score with 18 minutes left but NSW found their self belief and held out. And now we get a decider, and a chance for the best player on the field - Robbie Farah to keep proving that NSW can win with class in their lineup. What did you make of the match? Game 3 is 8:00pm on Wednesday July 4 at Suncorp Stadium in Brisbane. For the record: www.wdnicolson.com predicted a 16-12 NSW victory. The Good: They held NSW in the opening stages when the Blues had the run of the game, and they came like a freight train in the final 25 minutes to almost steal it. Cronk - bar sin bin - was their best. The Bad: Forward pack lacked true impact on the contest, missed Thaiday's presence. Slater busted, Tate hurt, Parker hurt, Cronk binning (saved 6 points but did it cost them 12? ), couldn't produce the big play late despite Uate gifting them chances. The Good: Farah was a force in the middle - as much defensively as anything making a 60+ tackles and keeping NSW rolling, Tamou again impressive in limited minutes, Gallen as advertised, Bird had impact, Lewis made some huge hits, Jennings saved the game and Hayne was again big play city. Brett Stewart made two tries happen and the bench did what it needed to do. Plus Carney had his moments and made them matter. The Bad: Uate's a liability right now, Grant and Merrin not used well by Stuart - not their performance, Creagh still not sure what role he's playing, Glenn Stewart and Morris aren't combining at all, Carney's goalkicking.